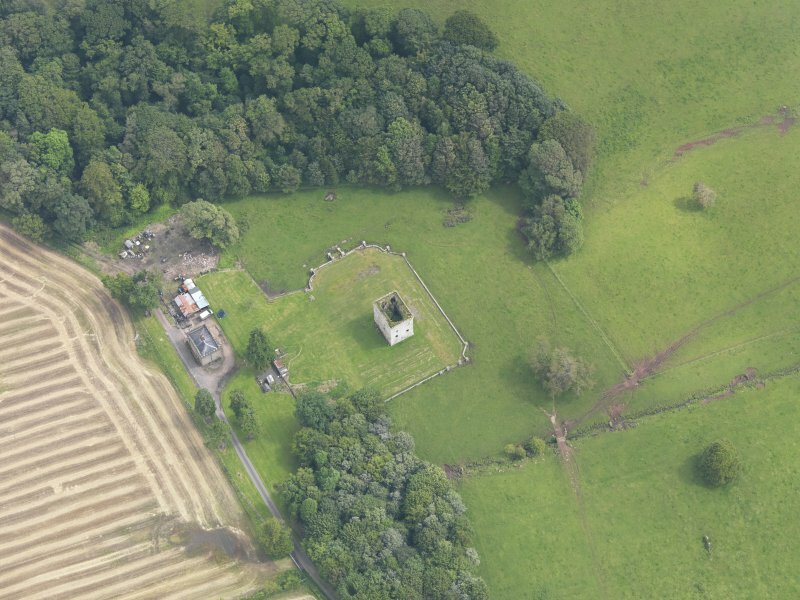 Oblique aerial view of Stapleton Tower, taken from the SE. View from SE of Stapleton Tower. Oblique aerial view of Stapleton Tower, taken from the W.
Oblique aerial view of Stapleton Tower, taken from the WNW. 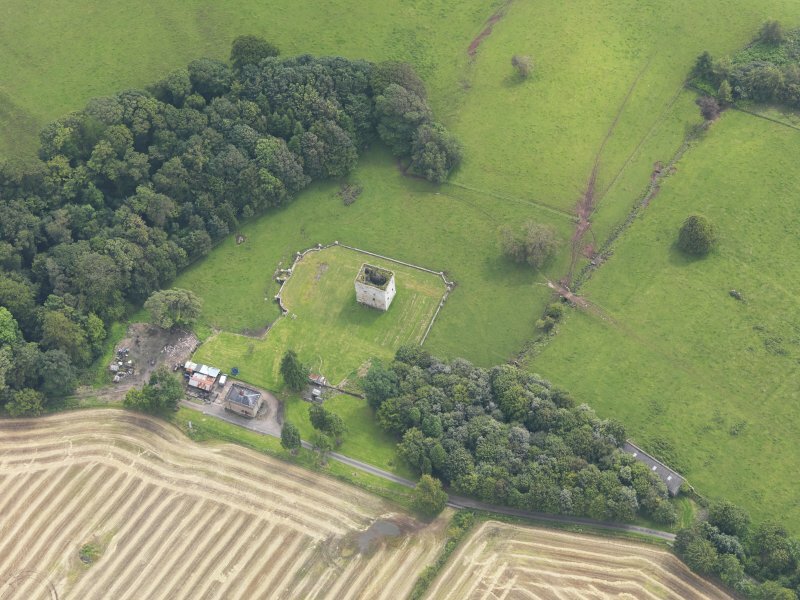 Oblique aerial view of Stapleton Tower, taken from the NNW. 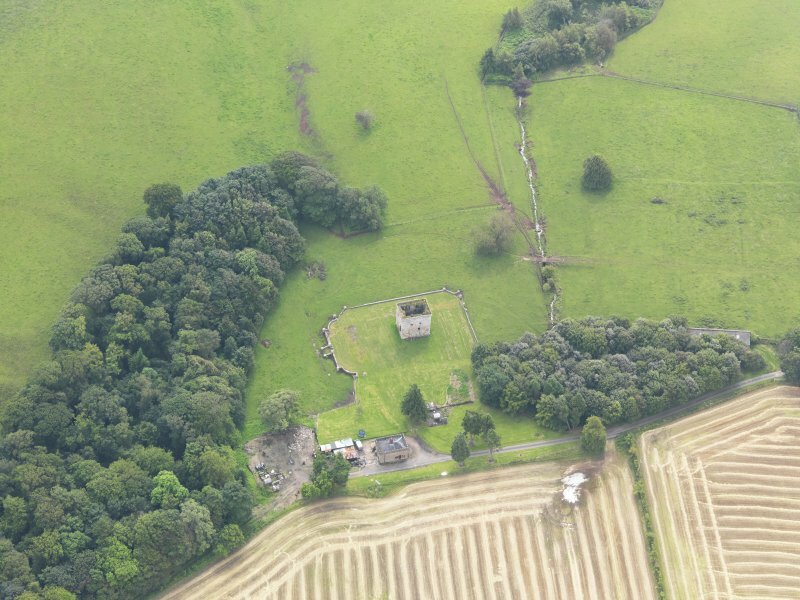 General oblique aerial view of Stapleton Tower, taken from the ENE. 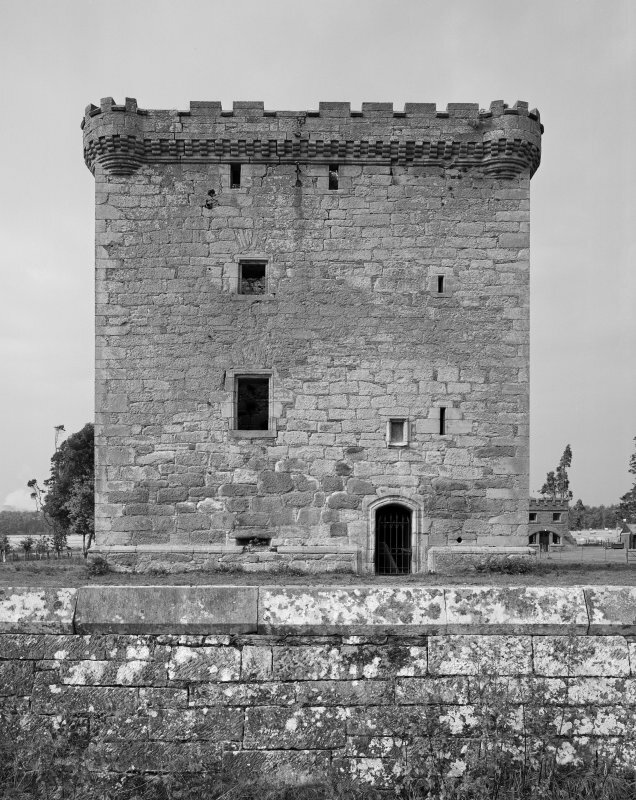 Stapleton Tower, which dates from the 16th century, is a simple oblong building 43 feet by 27 1/2 feet, by 41 feet high to the parapet. A modern mansion abuts on the north east and north west walls of the tower, which has been modernised and is still occupied. The modern mansion was demolished after the Second World War, but the tower is still entire although derelict. Visited by OS (JP) 22 February 1973. This tower, 13m long by 8.3m wide, was built in the 16th century by the Irvines. The shell of the three storeys over a vaulted basement with a spiral stair in the E corner remains fairly complete. 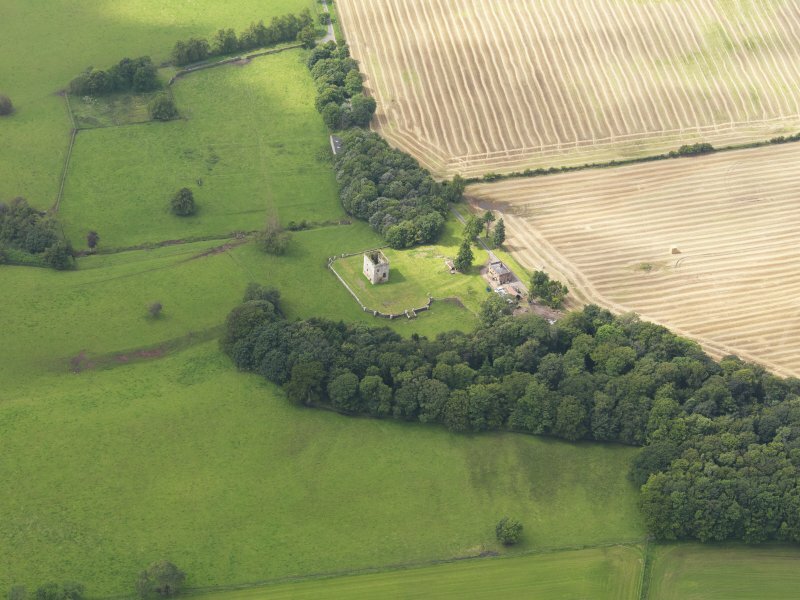 This 16th-century tower-house stands on a terrace with an open prospect across undulating ground to the Solway. 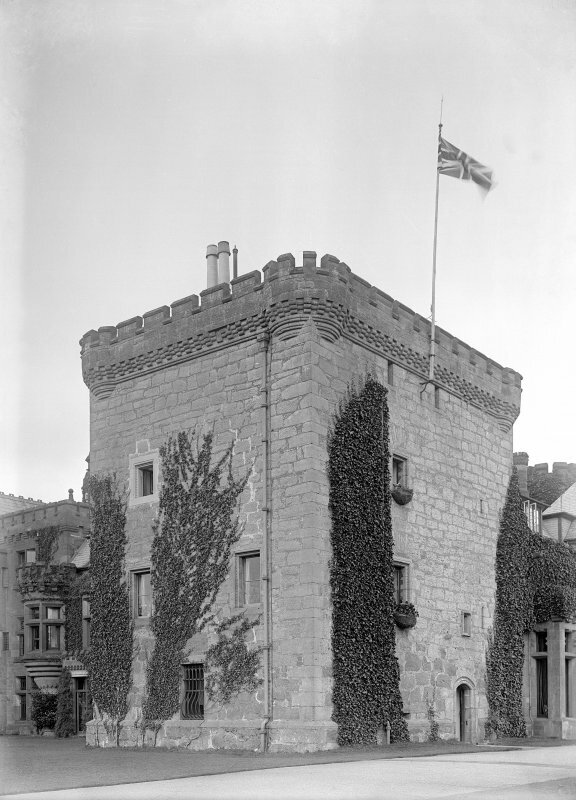 In the 19th century, the tower was incorporated into a mansion which enveloped it on the NW and NE. This house was demolished about forty years ago, and, although the scars still remain and the openings have been built up, the tower still stands to the height of its parapet. Rectangular on plan, it has three principal storeys and, formerly, a garret, and measures 11.6m from NE to SW by 8.6m transversely over walls up to 1.8m thick. A chamfered plinth extends around the base of the tower and breaks back either side of the doorway at the NE end of the Se wall. The doorway, which has a segmental head, has a moulded surround consisting of a quirked edge-roll and hollow, the latter enriched with a foliaceous stem. Above the doorway, at first-floor level, there is a niche for an armorial with nailhead ornament on the surround. A wide-mouthed horizontal gunloop is set directly above the plinth and others are visible at the same level in the NW and SW walls. The mouldings of the main windows take form of a double roll enriched with a medial band of nailhead ornament. The slit-windows lighting the stair, together with a pair beneath the parapet in the SE wall, are roll-moulded. At the height of the wall-head, there is a continuous parapet carried on a three-strand corbel table with corbelled interspaces. At the corners there are corbelled rounds. The crenellated parapet was probably reconstructed in the 19th century. Internally, the doorway opens into a vestibule with a combed ceiling (probably vaulted), and the entrance to a newel-stair lies on the right; the stair, which has been accommodated in the E angle, rises to the full height of the tower. On each floor the stair-chamber intrudes upon the living-space. A slab wrought with a stopped roll-moulding has been incorporated in re-use in the SW wall of the vestibule behind the door. The basement is vaulted in ashlar, has a mosaic tile floore, and, on the NE, a 19th-century fireplace. At first-floor level, the tower was provided with opposed window embrasures, aumbries, and, in the SW wall, a fireplace flanked by a pair of windows. Corbels (fillet and half round) supported the joisted floors above. The second floor also has a fireplace in the SW wall and an additional window embrasure in the NW wall. On the third floor, the garret, there are a press and two openings in the SE wall. One of the openings accommodates a turnpike stair giving direst access to the wall-head, while the other may have been a closet; both are lit by slit-windows. A small fireplace contrived in the NE wall was vented through a slab of the wall-walk. 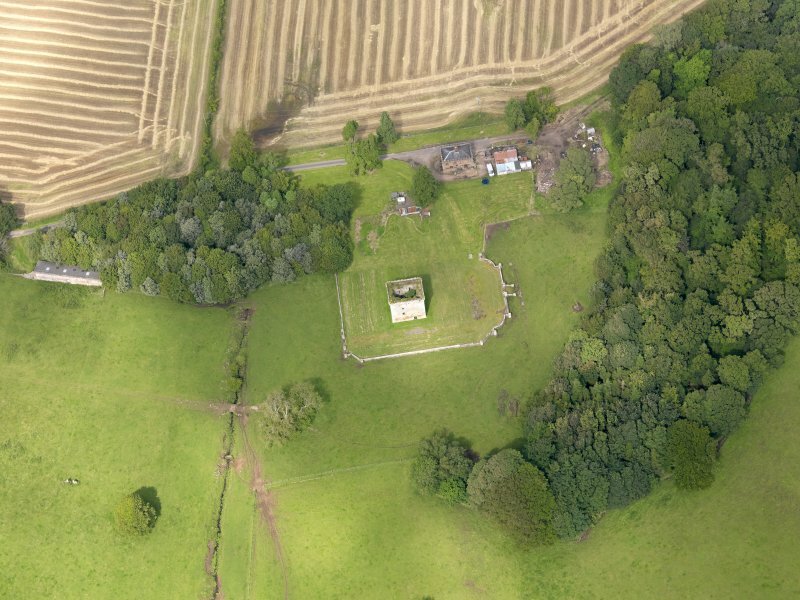 To the W of the tower, in open ground and turf-covered, there are traces of a formal garden.